Most companies do not have "spares" sitting around while they send their instruments in for calibration. Our ISO 17025 accreditation covers all manufacturers and brands. What is a Hydronic System? Hydronic systems for use hot and cold water to transfer heat. Hydronic systems rely on the distribution of water throughout the system. If the system is not balanced, operating costs will be higher than normal. this is measured in inches of water column (wg). In theory, there are very few differences between the two but it is important to know the differences, similarities and the importance of both. Someone designing a hydronic system would be abhorred if they did not take proper steps to ensure the head pressure of the system was calculated and designed around to ensure proper operation of the system. In a hydronic system, every foot of pipe, elbow and T creates resistance to flow. These fittings are classified with Cv ratings, and the pressure drop due to friction in the pipe is also measured. A standard 1/2” copper 90° elbow has a Cv rating of 2.5. This means that when 2.5 gpm of fluid passes through the fitting it creates a one psi pressure drop. Pipe will have a measurable resistance based on flow and size. For instance, 1/2” plastic pipe carrying one gallon per minute of fluid will have a pressure drop of somewhere around 1.1 ft H2O per 100 feet." 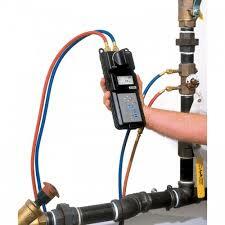 This is why it is important to have your hydronic manometer calibrated regularly.